GlassWire is a network monitoring tool that allows you to see exactly what is happening on your network, and to identify suspicious activity. It comes with a wide range of features designed to let you easily monitor network activity, including the ability to look back at what your machine has been doing whilst you were away. What really makes GlassWire stand out, though, is the way in which it presents information. 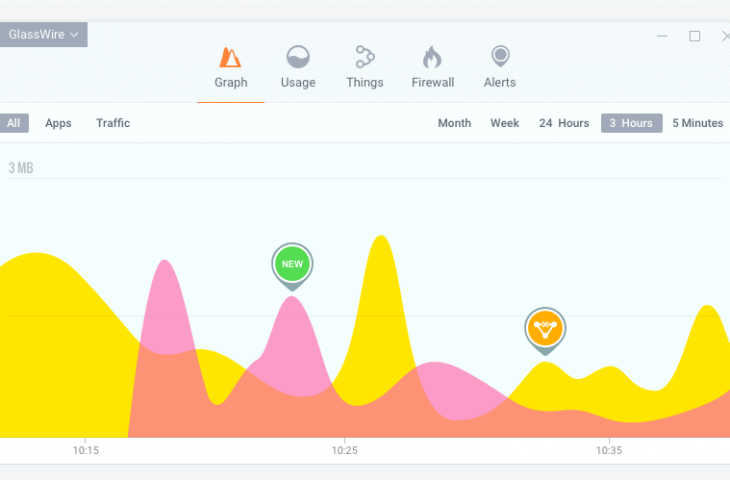 Unlike a lot of similar network monitoring software, GlassWire simply looks great. And best of all, GlassWire is free. Does that sound too good to be true? That’s what we thought. Today, therefore, we’re going to put GlassWire through its paces, and see if it lives up to the hype. Put simply, GlassWire is a network monitoring tool that allows you to see all the activity that is occurring on your network. Once installed, it will automatically track all traffic passed between your machine and the network(s) it is part of, log which application initiated each connection, and tell you where data is being sent to and received from. In addition, GlassWire includes an advanced firewall as standard. This allows you to block suspicious connections, helping to keep you safe from cyber attacks and malware. A network monitoring tool like GlassWire can be a powerful method of defense against cyber attack, because it allows you to instantly spot any suspicious connections. That said, even GlassWire themselves admit that their monitoring software, on its own, is not sufficient to provide total protection against every form of attack, and that therefore you should also use good anti-virus software alongside it. GlassWire comes packaged with an impressive variety of features and tools as standard. Let’s take a look at some of the most useful. At the heart of GlassWire is a screen that displays a visual representation of network activity. This graph shows upload and download activity in real time, and automatically displays an icon when a new connection is made. Hosts are automatically resolved, and information on their country of origin is automatically displayed. This approach certainly provides a powerful way of keeping track of network activity, with the ability to break down this activity by traffic type. Best of all, the way in which GlassWire presents this information looks great. Whilst having your network activity presented in an attractive way may sound like an unnecessary luxury, in practice presenting important information in this way means that you are more likely to check it, and therefore more likely to spot suspicious activity. A network monitoring tool like GlassWire should form part of your standard toolkit of security and privacy software. Just be warned that GlassWire will not automatically counter every threat that it detects. It will help you to identify suspicious activity, but it is up to you to take action to avoid the consequences of this. That said, GlassWire does a relatively good job of spotting strange network traffic. The software will discreetly notify you when a new application accesses the network. It also implements a series of rules designed to detect system file changes, device list changes, app info changes, and ARP spoofing. These security measures do not match those of dedicated security software, but then GlassWire is not designed to be your only line of defense. When combined with other security tools, such as a VPN or anti-virus software, GlassWire merely adds another layer of defense, albeit a welcome one. One of the most exciting features of GlassWire is the ability to look back at network activity. This feature is implemented in a number of ways. 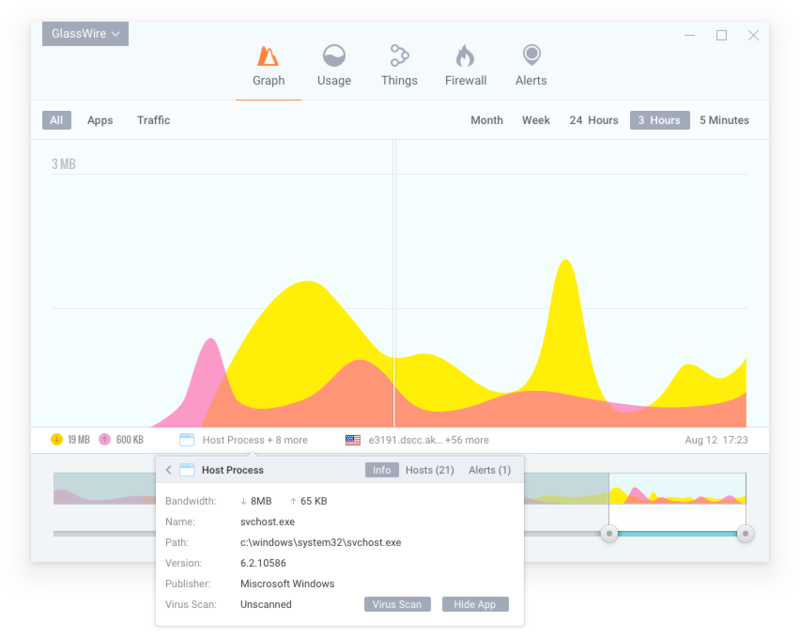 The first is similar to most network monitoring software: GlassWire allows you to display graphs showing inbound and outbound connections for a given period, be it yesterday or last month. Another very welcome feature, though, is the ability to tell GlassWire that you will be away from your computer for a while. You can instruct GlassWire to block all network activity for a particular time period, or simply ask it to block all activity until you return to your computer. On the other hand, if you let network activity continue as normal whilst you are away, GlassWire will automatically inform you, on your return, as to what your computer has been doing in your absence. All of these tools are necessary because some advanced strains of malware are now designed to detect your absence. By doing this, they can avoid detection by only operating at the times when you are least likely to spot their activity. Beyond the beautiful design of the central graphs, it seems a lot of work has gone into making GlassWire’s interface discreet and easy to use. A major problem with network monitoring software has been that you can be constantly bombarded with alerts and notifications, particularly at times when you are running a lot of network activity. GlassWire’s alerts attempt to avoid this problem by quickly fading away. Even better, you have the option of setting a ‘snooze’ function, which blocks any alerts from appearing for a set period. These features help to avoid an overload of notifications, but can only go so far: properly monitoring a busy network is always going to generate a lot of alerts, after all, and so in some ways this problem is unavoidable. There is always the option to turn GlassWire alerts off entirely, of course, but this is not recommended. 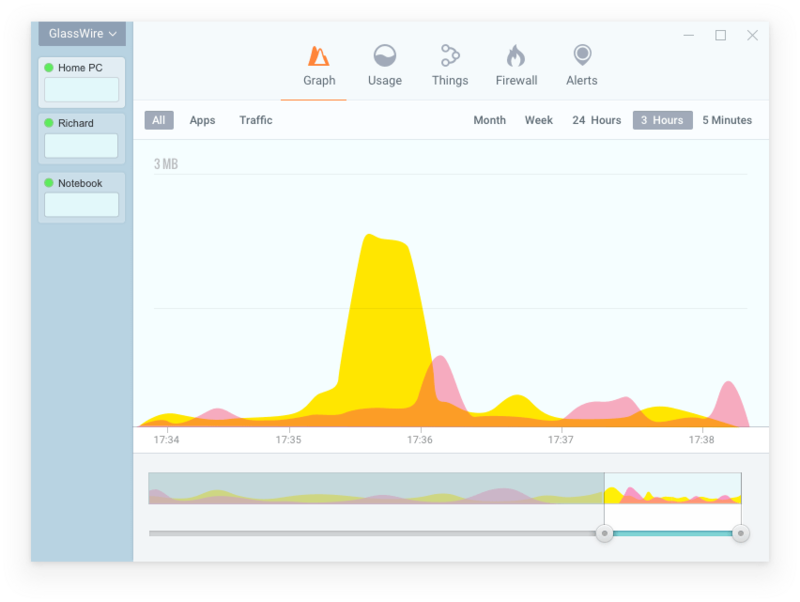 Other good features of the GlassWire interface are the mini graph that you are able to place on your desktop, providing compact real time monitoring of your network, and the ability to change skins. Overall, all this adds up to one of the most beautiful network monitoring solutions we have seen. Though GlassWire is primarily designed to detect malicious activity, it can also be used as an internet privacy tool. Every time you visit a website, GlassWire will automatically track the information passed between your machine and remote servers, and provide a list of every server your machine connected with. If you are new to network monitoring software, visiting a trusted website and looking at these results can be shocking. Visiting a popular website will often result in a long list of servers, some seemingly completely unrelated to the main site, but all of which can collect data on your system, browsing history, and IP address. GlassWire allows you to selectively block these servers, giving you back control over your personal data. GlassWire really comes into its own if you run multiple remote servers. This can be case, for instance, if you administer a server for your employer, run a gaming server, or use dedicated web hosting. GlassWire has been designed so that the same software can be installed on these remote servers as your home computer. The software also looks and works exactly the same no matter where it is installed. After installation, you can easily swap between servers in the main GlassWire interface, and monitor activity across all of them. This functionality is particularly useful if you are running a number of interconnected servers, because it allows you to quickly compare activity between them. Though not fully-featured network management software, GlassWire does provide a limited ability to administer local networks. This functionality is limited to the ability to see the devices currently logged into your local network, but is still useful if you suspect that your neighbour has stolen your WiFi password. 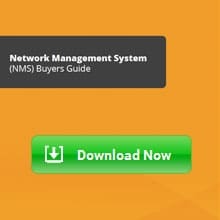 Just bear in mind that GlassWire is explicitly not network management software, and so if you want the ability to manage connections to your local network you will need to pair it with more advanced software. GlassWire also provides a number of other features that, whilst not technically necessary for network monitoring software, allow you to cut down on the number of separate applications you need to effectively administer your system. One of these features is a bandwidth usage monitor. If you have limited bandwidth on a remote server, it is possible to configure this tool in order to avoid running over your capacity. 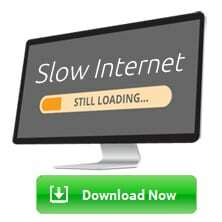 More useful, however, is the ability to track bandwidth usage by app or traffic type. 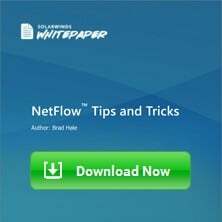 At a basic level, this can help you to weed out applications that are using more than their fair share of bandwidth. It can also help you to detect unwanted activity, because a strange app using a huge amount of bandwidth, or connecting with unrecognized servers, is a sure sign that something is amiss. One more small feature that GlassWire provides is ‘evil twin’ detection. This innovative feature is designed to protect you against the threat posed by public wifi networks, which are a notorious source of phishing attacks and malware. GlassWire automatically detects if new WiFi hardware sharing the same network name suddenly appears, as this could be a sign that an attacker has duplicated a public network in order to collect personal information. 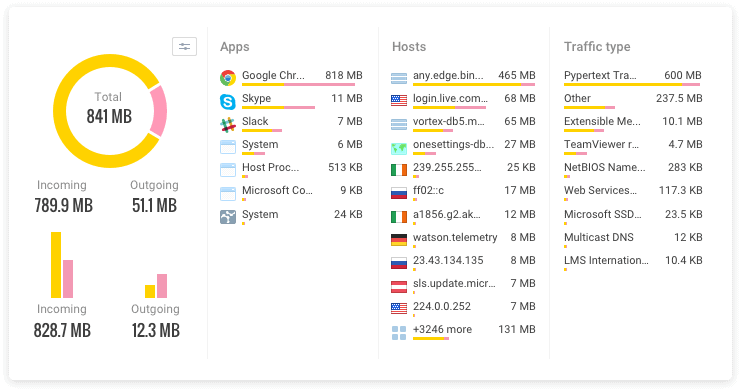 GlassWire is not the only network monitoring software out there, of course, and so having looked at all the features it offers, it's worth looking at how these translate into concrete advantages and disadvantages. The set of alerts that GlassWire provides, and particularly the protection against ARP spoofing, puts it in the top tier of software of its type. Though, at present, it is not able to detect every form of threat out there, we are assured that in time more rules will be added in order to provide even more comprehensive protection. The firewall provided as part of GlassWire is not, on its own, a class-leading piece of software. However, the ability to configure this firewall against network data means that it is far more configurable than standalone firewalls, allowing you to blacklist connections specific to your work environment. Another advantage of GlassWire is that, even though it has not been designed as a privacy protection tool, it actually works quite well as one. Being able to see all the remote servers your machine connects to is, in itself, a good way to start limiting others’ access to your data. By far the biggest advantage of GlassWire, though, is the interface that it provides. 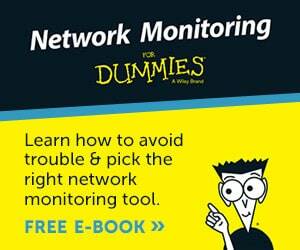 Whilst other network monitoring software offers some of the advantages and features above, none does so with such style. 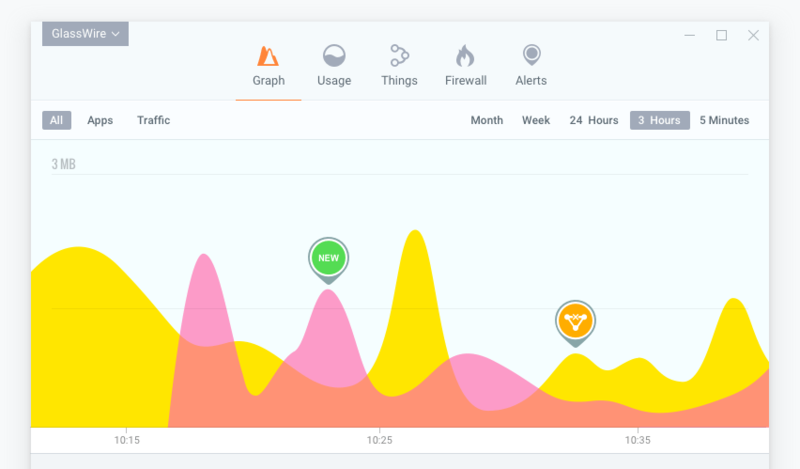 Although pretty-looking graphs might sound like a frivolity, in reality the ability to quickly see what is happening on your network means that GlassWire is simply more user-friendly than the competition. The disadvantages of GlassWire stem more from what it isn’t rather than what it is. 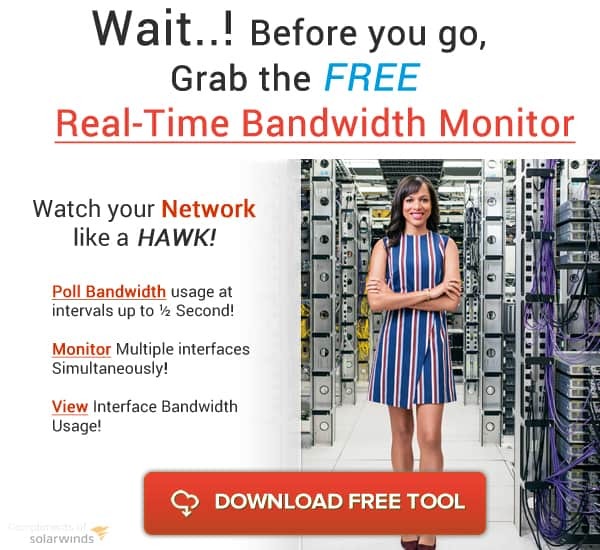 Though a great piece of software for monitoring home and small-scale professional networks, if you are the administrator of a very large corporate network it is worth investing in software with true network management capabilities. Similarly, you shouldn’t rely on just GlassWire to provide security and privacy. At its best, it is a powerful addition to an existing suite of security and privacy tools, operating as a second line of defense against malicious incursion and malware. 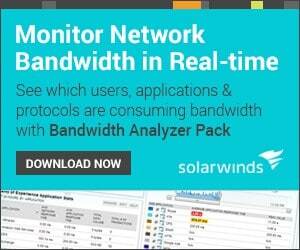 Overall, GlassWire offers a great solution for network monitoring. It manages to include a wide range of features and tools into a single beautiful interface, and allows you to assess what is happening on your network at a glance. This makes GlassWire a particularly attractive piece of software for home users and small businesses: it is intuitive to operate, and as such is well suited to those coming to information security for the first time. Being able to spot malicious activity relies, after all, on knowing what this looks like, and after just a few hours using GlassWire most users will have a good idea of how to protect themselves against many common forms of attack. And even for those of us who are experienced information security professionals, it is refreshing to use a piece of software that is so pretty.